A Vietnamese mother and her children wade across a river, fleeing a bombing raid on Qui Nhon by United States aircraft on September 7, 1965. 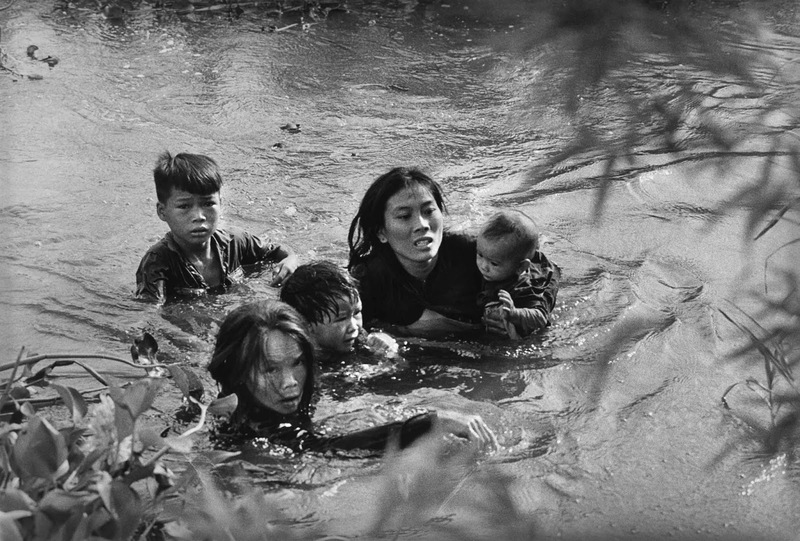 Photo depicts a South Vietnamese mother fleeing through a river. She and her four children were forced to leave their village, Qui Nhon, near Quinbonso. The U.S. Air Force had asked all inhabitants to evacuate the village because the Vietcong had been using it as a base camp to fire at the U.S. Marines. This picture was 1966 World Press Photo of the Year. After he won the prize, photographer Kyoichi Sawada searched and located the two families in the picture and gave them all the prize money, and each a copy of the photograph. Four years later in Cambodia, 1970, photographer Kyoichi Sawada died in the field, doing what he loved most. The American base was under constant attack from Viet Cong snipers, hiding in the surrounding villages. Now the Americans were striking back, at the same time destroying the village. The attack was part of an elaborate clearing operation, whose purpose it was to drive the Vietcong members out of the coastal area in South Vietnam. The assault was named Operation Piranha after the dangerous South American fish. lt employed more than 5,000 troops. In each village that was believed to shelter Vietcong guerillas. Women and children were advised to leave before the attack would commence. The Communists fighters often used women and children as a screen for their operations. Operation Piranha concluded on 10 September, 178 VC had been killed and 360 enemy and suspected enemy had been captured. Allied losses were two Marines and five South Vietnamese killed. The operation failed to wipe out the 1st Viet Cong Regiment (the primary target), villagers told the Marines that Vietcong units had been in the area but had left, some less than 24 hours before Operation Piranha had commenced. Intelligence reports later indicated that the 1st VC Regiment began leaving the peninsula on 4 September, coinciding with the increased movement of the amphibious ships at Chu Lai Base Area. God! The horrors of war!